Approximately four dozen Sailors recently devoted three hours volunteering in Veterans Memorial Park while augmenting their professional development. The Sailors from Corry Station, Naval Hospital Pensacola, and Naval Air Station Pensacola were recently selected for advancement to Chief Petty Officer. This promotion is a significant milestone in a Navy career and only occurs after five weeks of post-selection training. 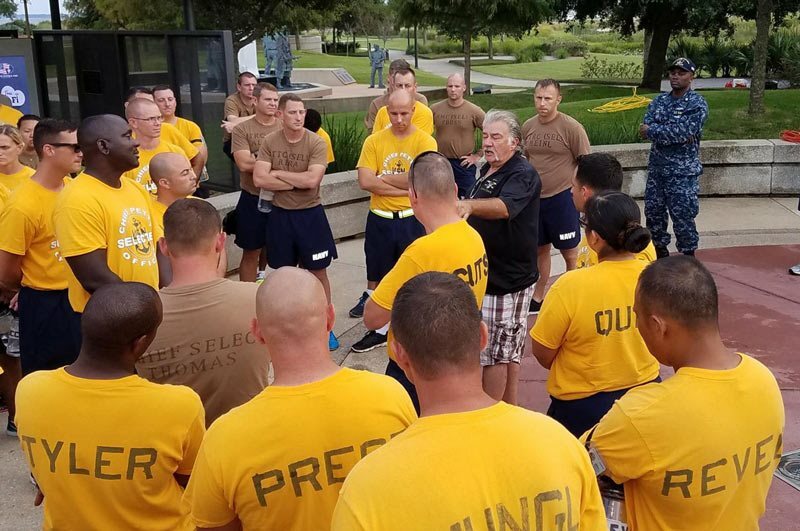 Across the Navy, this training includes community relations events. In Pensacola, an evening of service and fellowship at Veterans Memorial Park has become the tradition. Now in its fifth year, the Chief Petty Officer (CPO) Selectees come to the Park and wash the Wall South and conduct a general clean-up. They finish the event by tending to the Monument to Children. The overwhelming majority of this year’s CPO Selectees in Pensacola have families. After a short speech by the event coordinator, the CPO Selectees wipe down the monument, pull weeds, and make sure she is looking shipshape. This aspect of the event puts an emotional stamp on the evening and reinforces not only why these Sailors serve their country but also reminds them about the family love and support that helps make them successful Navy professionals. The Sailors also benefit from an opportunity to network, a key part of being a successful CPO. There are two CPO Selectee training programs in Pensacola, one on Corry Station and one on the air station, so these Sailors don’t all know each. They also benefit from the involvement of active duty and retired Chief Petty Officers who are on hand to help with the project, answer training questions, and provide career guidance. The Veterans Memorial Park Foundation board of directors appreciates these and all our many volunteers and looks forward to the sixth annual CPO Selectee event next year. Congratulations on your selection and best wishes in your careers.